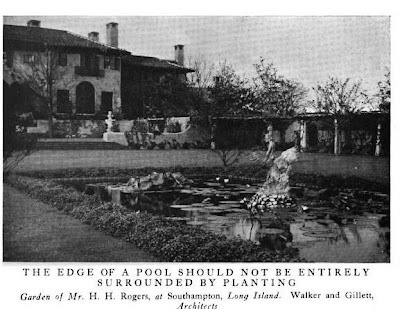 The garden at 'Black Point', the Henry H. Rogers estate designed by Walker & Gillette between 1914-16 in Southampton. Clearly, the edge of a pool should not be entirely surrounded by planting. Click HERE for more on 'Black Point'. I'm sure that the pool is decorative- a reflecting pool, not a swimming pool. That would explain the plantings. The March 16, 2010 edition of the NYT's had a reflection on Millicent Rogers, who lived in Black Point. If I read the article correctly that manor house and property included into Rogers 'Port of Missing Men'?